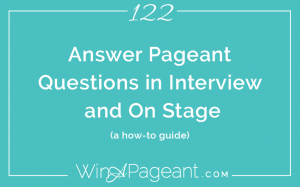 Today, I want to break down how to answer questions during your pageant interview and also during your on stage question. These are both wildly important phases of competition and allow you to showcase your greatest qualities – if you prepare correctly. 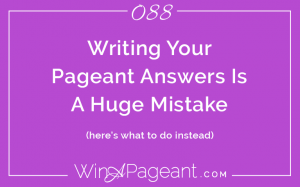 I’m going to give you 3 tips to be a pageant professional so you can start to incorporate these elements into your question-answering process in your pageant. You heard women talk in circles as they answer an on stage question. They have no organization to their response and it ends up all over the place. Don’t do that. Instead, visualize your thoughts organized with a beginning, middle and end. I like to answer the question head-on, then use a story to explain my answer. So, my organization is Answer-Story-Smile. No matter what question you’re given, you can give an answer, tie it to something personal, then close with a smile. For example: What is your biggest dream? To be interviewed by Oprah. As a kid, I wanted to host a tv show. As I’ve grown up, I’ve paid such attention to the hosting style of the greats like Oprah. I’d love to experience her work sitting on the other side of the end table. So many women fake their answers in effort to sound poised, put-together, sweet, or compassionate. If those aren’t your star qualities, don’t try to fake them. Instead, be real! Talk about the things that no one else would talk about, but everyone is thinking. You’ll be much more relatable as a real human than as a pretend Barbie doll. Pageants are all about sharing who YOU are in a way that people feel like they know you. You can’t do that if you don’t know yourself. Contestants wreck their interviews when they answer a question about themselves in a way that isn’t truly authentic – the judges see it, you feel it, and it’s not your truth. In order to really share who you are, you have to know yourself deeply. You coach can help with this a lot. The good ones are trained to point out your greatest qualities, even when you can’t see them for yourself. This level of awareness is vital in your pageant. Today, I’m going to give you 3 steps to figure out the deepest fears holding you back and turn them into your advantage to win. Before we dive in, I want to share with you some updates. My signature program, The Pageant Interview Game Plan is open for enrollment. This program is an online video training course to nail your pageant interview in just 4 weeks. It walks you through everything you need for pageant branding, platform, legacy project, communication, confidence, how to prepare, what to wear and even how to walk in your interview. The best part of the course is that it is heavily supported by a Private Facebook Group. Members of the Game Plan get into the group and can ask questions and get answers on everything! Like, what the other girls think about a certain pageant system, or which headshot is the best one, or how to fill out their paperwork. It’s a thriving group that I’m coaching in almost every day. We have a blast and it’s fun to see how each woman is growing her platform, changing her community, and becoming truly beautiful. You can get the scoop on that by going to Interview.WinAPageant.com. The next cool news… In recent years, I have not been doing 1-hour sessions because I found that many women would show up with no information, no clue, and no idea what they were doing. They’d spend $300 on a coaching session and it would be me giving them a list of basics to start with. Now, however, I realize that if you’ve listened to the podcast and doing the work long enough, you’ve got the basics down. Maybe you just need help organizing your thoughts or you’re hung up on one area of the pageant that you just can’t seem to master. For you, I want to offer private coaching. I have set up a few different options. a 1-hour coaching session, which we do over the phone. You’ll fill out a form beforehand so I know what pageant you’re doing, how old you are, that sorta thing. This is a 45-minute session that happens on Skype. We do several mock interviews back to back and you’ll get to practice the feedback in between. These sessions are not cheap-o. Okay, this isn’t Pageant 101. It’s not for girls under 13. This is advanced stuff. If it’s your first pageant, listen to some of the podcasts, get a head-start so you aren’t showing up green. These are best for women who feel like they’ve put in some practice already, done some research online a bit, but are still not fully ready for stage. Like, you know in your heart you could win this thing, but you know you need to improve. I’m your girl. We’re gonna get to the bottom of it and shape you up so you are ready for the stage. Ok…. Now, let’s bust off your fear and show you how to win!! When you first sign up for a pageant, you’re all excited, fearless, and secure in your ability to win. As the pageant gets closer and closer, fear starts to creep in. It shows up in many ways, today we are going to look at fear manifesting as the Impostor Syndrome and the Skeletons in Your Closet. Impostor Syndrome comes from focusing on your flaws. It’s when you start to believe that despite all the great things weighing in your favor, you don’t belong in this place, with this title. Fear forces you to look at your lack of experience, your flaws, your insecurities, and your shortcomings to tell you that you are an impostor! You aren’t a true queen. God would tell you otherwise. He would say, You can do all things through Christ who gives you strength. To advance to a new level, you have to do something you’ve never done before. If you’ve done it then it wouldn’t be so impressive. If you were Miss Utah USA last year, and you’re competing against the same girls this year with that year of experience, it’s not fair and it’s not going to help you reach any higher goals. God wants you to do things outside of your strength, so that He will SHINE. The second way that fear manifests is with the Skeletons in Your Closet. These are all the yucky things that this world did to you that you’ve shoved into the back of your mind and heart into the depths of the closet. You haven’t taken the effort to clean out the closet so the skeletons are still lurking there haunting you. The Skeletons in Your Closet are the things you hope no one ever knows about you. Your past, your upbringing, your misfortunes, your mistakes, your bad choices. Fear wants you to focus on the guilt, confusion and shame of your past and uncontrollable circumstances. Fear, guilt, shame, confusion — those things didn’t come from God. He can’t give you those things because God is love! God wants to restore your joy, hope, peace, and your drive to seize what He has claimed for you. Listen, we all have all of these things. That is the nature of the world. It’s a constant battle to overcome these thoughts and rise above. And, you have the responsibility to do so. I’m gonna teach you 3 steps to fight off the Imposter Syndrome and clear out the Skeletons. This episode is based on the Romans 8 Principle. I love how it says, His purpose for them, meaning, what God wants for us. I believe that God put a dream on the inside of your heart to win this pageant. He gave you a vision to become someone great and you achieving it will bring glory to Him. If this is truly His purpose for you, then He’s going to work together all things for good for you. How cool is that? So, you don’t have to do this step, because God will do this naturally. However, this exercise will strengthen your faith that even the worst things can be made good. Step 1: Get a piece of paper and make two columns. In the left column, make a list of all the things that you see as a disadvantage. What disqualifies you from winning? Your short hair, your job, your small town, whatever it is that you think could be a good excuse for you to not win. This should be easy, because we are trained by society to compare our shortcomings to other’s best features. Still, dig deep. Consider what you hope no one will ever find out about you. What skeletons are you hiding? Do this in a private place because it’s likely that these fears will carry emotions with them. Especially if they are things you haven’t considered before. For example, you may write down that you are embarrassed that you are an animal rights activist, but you ran over your cat 2 years ago and didn’t realize until you came home to it’s lifeless body. Step 2: In the right column next to each line item, I want you to get creative. Think about how this item could be used for the greater good of your family, your community, your city, your office, your school, your state, your nation when you win this pageant. What impact will this line item have on your reign for the better? This will not be easy. I’m asking you to function outside of the norm, to turn your perspective from fear to love. This is hard for most humans, but it is wildly transformative. Using the previous example, you may actually be able to share this story and how even a person with the best intentions could have an accident, which is why everyone needs to take necessary precautions to protect their pets. Take your time on this step. There may be some item that you struggle to find the good. Let God reveal it to you, or trust that He will handle that one. If you can create a list of reasons to choose love, how much more will God use your shortcomings to show off His strength?! So much more! Step 3: The final step is to start believing it. To truly believe something is to act as though it is truth. Believing in something is more than just knowing it exists, it’s behaving and living as though it is the highest truth. If you ran your cat over and you can use that story for a greater good, start doing it now. God promises that He causes ALL things (even the things you think are ugly, even the things your embarrassed by, even the things you wish weren’t true) to work together for the good of those who love Him and are called according to His purpose for them. 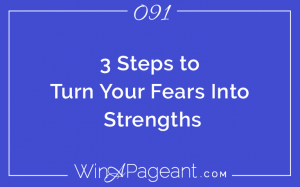 Don’t let fear bully you into losing your pageant. Look it in the face and scream Romans 8:28 at it! Thank you so much for joining me today. If you’re ready to take your pageant coaching to the next-level, I’d love to work with you get the scoop on how you can work with me at WinAPageant.com. I’ll see you on the next Win A Pageant Wednesday! Hey, girl! Today is the day! If you are joining me on the day this podcast is live December 14th then you are in luck, chica! Today is the final 2016 Pageant Interview Master Class – “The 4 Steps to Gain Confidence in Your Pageant Interview”. This is the last time I’ll be teaching this exact material for free. Join me Live on Facebook today at 3:00pm San Diego time (that’s 6:00pm ET) on the WinAPageant Facebook page. We’re talking about how to connect with the judges, and the 4 steps that HAVE to be a part of your pageant interview preparation strategy. If you are serious about winning your pageant this year, you need to be a part of this free training to get your ducks all lined up, girl! If you’re the type of girl that won’t remember, tell Siri to remind you right now or go to Facebook.com/WinAPageant and like the page so you’ll get a notification when we go live later today. See you this afternoon! Ok.. let’s dive into today’s episode of the Win A Pageant Podcast. I’m your coach Alycia Darby. Most women know they need to practice for their interview, but it tends to get confusing on exactly HOW to practice. Today, I’m going to break down the 3 ways of practicing for your pageant and give you some examples of how you can do each one. This is practice that doesn’t require much effort. It’s Googling around for questions online and then thinking in your mind how you may answer them. Or, flipping through pageant flash cards asking yourself questions. It’s low effort because it doesn’t require anyone else be a part of it. I believe this type of practice is important. So much so that I actually give all my VIP clients custom Flash Cards they can use to practice. But, this alone isn’t going to win you the pageant it’s easy to do, but doesn’t have much reward. It requires far more effort. This is when you are interviewed by a media station or share a q-and-a from stage as visiting royalty at an appearance. It’s real life practice that requires some effort because it involves more than just you sitting at your desk. It requires a plan, an outfit, a microphone, a whole set of circumstances to support the practice. It pays off, too! But, still not as much as the third form of practice. Ya can’t beat it! It takes a ton of effort, but has the greatest reward for your success in your pageant because it is a simulation of the actual experience. It gives you the best opportunity to feel the true emotions of the interview process and practice your skills in the exact environment. It takes some effort to set up because there are lots of other people involved, you are responsible to find a location, invite the right people, lead the process, explain it to the mock judges, film it, thank everyone… it’s not easy, but then if it were, everyone would be doing it. If you want to win your pageant, you have to out-practice to out-perform the competition. A good rule-of-thumb is to plan a mock interview once a month. After monthly interviews, you’ll have the process down, you’ll know how to distinguish valuable verses silly feedback that you’ll get, and you’ll be practiced, but not rehearsed. Mock Interview practice gives you the best opportunity to feel the true emotions of the interview process. Not all practice is created equal. It is not enough to scroll through questions online and think you are prepared. Schedule a mock interview to get some experience to increase your confidence. That my dear, is how you win a pageant! Thank you so much for joining me today. I’ll see you this afternoon at Facebook.com/WinAPageant for our final Master Class of the year!